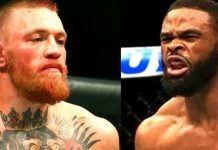 Home MMA News Tyron Woodley Does a future fight with Tyron Woodley make sense for Conor McGregor? 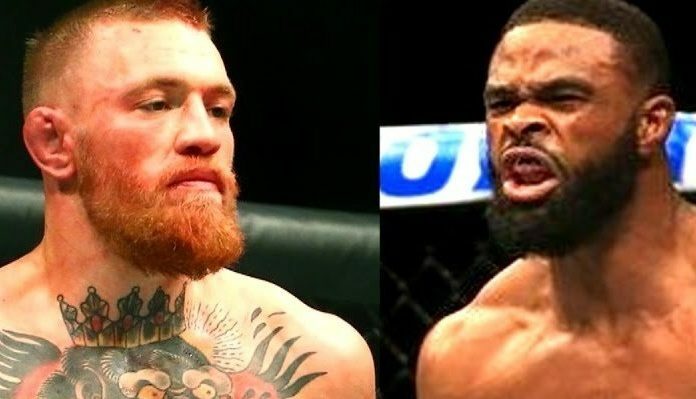 Does a future fight with Tyron Woodley make sense for Conor McGregor? 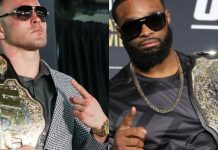 Tyron Woodley will be watching from afar with a vested interest in less than two weeks when Conor McGregor makes his long-awaited return to the Octagon for a lightweight championship fight against Khabib Nurmagomedov at UFC 229. It’s not about the cheap thrills, booze guzzling and quote-worthy commentary that typically precedes the McGregor Show—a lavish fight spectacle that has never failed to live up to the hype. 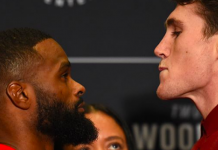 Woodley is standing on McGregor’s doorstep looking to pick the most lucrative fight of his career. If the Irish legend defeats Nurmagomedov and reclaims his lightweight throne, maybe he’d consider doing what’s never been done and moving up to welterweight to vie for a third division title. What’s left after the fight with Nurmagomedov, as McGregor himself questioned onstage at last week’s pre-fight press conference? Of course, there is a long line of deserving contenders waiting in the wings for a chance to win the lottery ticket fight, but McGregor’s thriving popularity—love it or hate it—has transcended title defending in a traditional sense. He has a featherweight and lightweight title sitting on his mantle that have both never been defended. 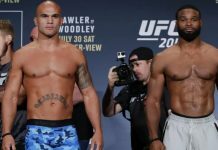 The UFC had always obliged in putting everything on hold whenever he decided to pursue outlandish feats such as fighting Nate Diaz at welterweight, challenging Eddie Alvarez for the lightweight title and pursuing a boxing match with legendary fighter Floyd Mayweather Jr. He has never shown any interest in staying put and racking up title defenses within the same division. The reigning welterweight king’s timing is impeccable in opening up about a potential fight down the road with McGregor. Ahead of what is being billed as the ‘biggest fight in MMA history’, he is making himself the elephant in the room McGregor can’t avoid acknowledging, if he does what he says he’s going to do on October 6. 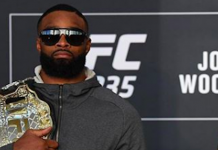 A rubber match with Diaz would also be warranted if he gets past Dustin Poirier at UFC 230, but Woodley makes a valid point when it comes to McGregor, who is more motivated by achieving the impossible over what’s expected. Fighting is no longer his monetary obligation. He could have ridden off into the sunset as a two-division MMA champion that managed to pull off the cash grab of a lifetime in a historic cross-promotional bout with Mayweather, but he returned to his old stomping grounds in the UFC for a grudge match with Nurmagomedov. 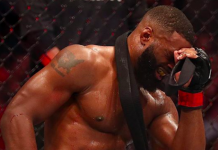 If there’s fire in his belly to do the same after UFC 229, Woodley will be waiting.